It has been learned that the shouts of warning urging that the [illegible] be stopped came from Harvey Higgins of 814 Yale st., and Lieut. Lester Hardy of the Goodrich fire department, who occupied seats in the first car. Following the accident, Higgins was found wandering in a dazed condition about the park and was removed to the hospital. Lieut. Hardy was only slightly injured, one leg showing bruises. 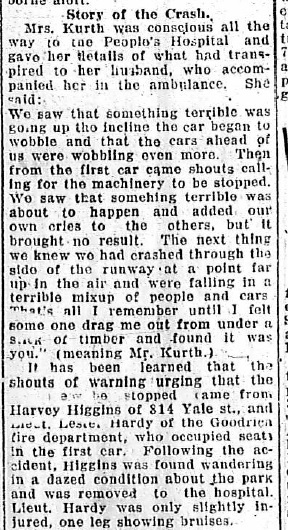 This entry was posted in 1918 Roller Coaster Accident, Newspaper Clippings, Yegerlehner and tagged Agnes (Layden) Kurth, Akron, Akron Beacon Journal, Erich A. Kurth, Harvey Higgins, Lieut. Lester Hardy, roller coaster accidents, Summit Beach Park on January 1, 2014 by Deborah Sweeney.